After our customer initially had a nice heavy shower door in mind for his master bathroom, when we went out to quote and measure he decided to change it up and do a more complete steam shower. This included a full height 3/8" door and notched panel on a 90 return with chrome hardware and clear glass to subtly accentuate the beautiful tile work. 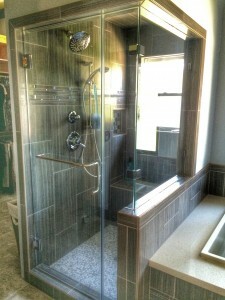 Topped off with poly-carbonate seals to lock in the moisture, and a unique towel bar and handle, this innovative shower steam room completes this satisfied customer's personal spa getaway. Our experienced installers can make your bathroom the heaven you dreamed of!